– The “defeat a player of level X” achievements have been extended. You can now get achievements for defeating a player of levels up to 63 (previously, they stopped at 52). – Player’s profiles now show the percentage of achievements they have unlocked. This percent just counts achievements, not trophies (you can get to 100% without any trophies). – When customizing settings, there’s now a “Pure Skill” tab that makes it easier to design settings that WarLight considers pure skill. – The real-time ladder now gives 8 minutes of banked time instead of 5, to make up for the lobby no longer being present. – The map-of-the-week auto game now uses more lengthy boot times. – The Create Coin Game page now displays links to existing coin auto games. – Added coin balance as dollars in parenthesis next to it. – Fixed a bug in games with banking boot times that made that made the auto-booter not boot a player when another player was auto-booted earlier that same turn. – Fixed a bug that sometimes considered single-player levels won after 0 turns. – Fixed a bug in the display of the “First turn speed” column of the Players menu. It was adding an extra 0 after the decimal, for example it listed 3.4 seconds at 3.04. – Fixed a bug that made the rematch button error out with “Invalid teams” if used on a team game where someone declined. – Fixed a bug with tournament chat timestamps that that made it apply your timezone offset twice, causing the times to appear incorrectly. WarLight has just been updated to version 3.08.0! This update adds the Bomb Card to coin games, and adds the ability to play coin games at low-wagers. For the first time since 2010, WarLight now has a new card! The Bomb Card is initially available in coin games, but in a future update it will become available for members to use in all games. Check it out today, in either the Small Earth 1v1 coin game, the Earth 1v1 coin game, or the Four Castles FFA coin game! 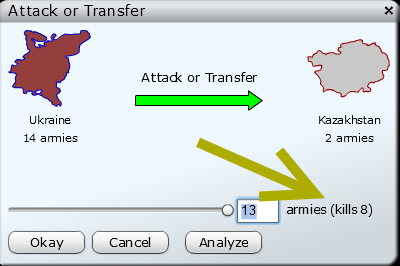 This allows you to easily drag the slider up and down to more easily determine how many armies to attack with, without having to keep checking Analyze. For those who want to experiment with coin games, but at a lower amount, WarLight now offers coin games that only cost 5 to 10 coins to join! These games can be found on the Coins tab, or under the Promoted Games section of the multi-player dashboard. These games are only available to players who hold a coin balance of 1,000 or fewer coins. It’s no longer necessary to click Join Game for ladder or tournament games unless you must choose a color. Games where all player’s colors (or alternate colors) are available will just skip the lobby completely. – The “Fast” boot option for multi-day games now means 1 day 10 hours (34 hours) instead of 25 hours. – Updated the minimum version of Flash required to 11.1. – The “show more promoted games” link has been replaced with a horizontal listing of the templates available. You can click to expand each template. – If you join an open tournament, it will now state next to it that you have joined it in the Open Tournaments section. – Added member icons on the leaderboard and tournament players tab. – In tournament chat, moved the tooltip that displays the message sent date from the message text to just the name of the chatting player. – Fixed a bug that allowed scenario distributions to be considered pure skill templates, even when they were not evenly matched. – Fixed a bug that caused the “territory limit” setting to be hidden in games that use custom scenarios. – Fixed a bug that caused open tournaments to show “Unread chat” immediately after you joined, even if you had read the chat. – Fixed a bug that allowed you to close the “Begin” dialog with escape.